Scientists working at 16 agencies report that increased political pressure and shrinking workforces under the Trump administration have limited their ability to do their jobs. The Union of Concerned Scientists, together with Iowa State University, last week released a report based on its survey of more than 63,000 federal scientific experts. 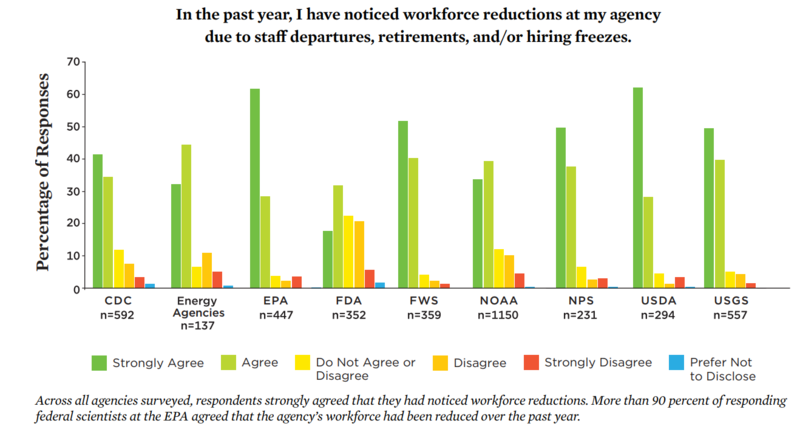 to staff departures, retirements or agency hiring freezes. Of those, 82 percent said those reductions made it more difficult for their agencies to fulfill their scientific missions. Nearly a third of EPA scientists who took the survey agreed that political hires and the White House had impacted agency policies under the Trump administration. President Donald Trump’s fiscal 2019 budget plan calls for a 20 percent reduction in EPA staff, even though the agency’s workforce has shrunk to its lowest point in 20 years. Office of Management and Budget data shows the EPA shrank its workforce by more than 1,000 employees between December 2016 and March 2018. As of March, it has a workforce of 14,645 employees. In that same timeframe, the National Park Service has lost nearly 1,200 employees (17,872 total workforce) and the U.S. Geological Survey has lost more than 500 employees (7,809 total workforce). The report also highlighted instances when scientists reported censorship, or self-censorship, based on pressure from political leadership. The National Park Service, for example, reported the highest rate of climate change censorship. A survey-taker from the U.S. Geological Survey said political appointees now require review and approval of all research grants over $50,000. “This impedes new and ongoing research. They react negatively to any surprises; hence, even positive research findings often are not publicized. They want to know who is funding and who is a partner on every research project. They want to see a list of all proposed publications well in advance,” the USGS employee wrote. A scientist from an unspecified energy agency said his colleagues have limited the use of certain words and phrases in their research. Under the Trump administration, the EPA’s Region 5, which covers the Great Lakes and surrounding areas, has lost about 100 engineers and scientists. Mike Mikulka, president of AFGE Local 704, which represents Region 5 EPA employees, told Federal News Radio in July that of those 100 departures, 28 employees left the agency under the buyouts and early retirements offered last year. However, several recent hires who joined the EPA around 2015-2016 had also left the agency. “They thought the grass was greener on the other side of the street, in a different job in the private sector or elsewhere in the federal government,” Mikulka said. At House Appropriations Committee hearing on April 27, Rep. Marcy Kaptur (D-Ohio) highlighted several critical workforce vacancies in Region 5. “In that region, there are zero hydrogeologists, who are the people who determine how the toxins may spread and endanger other citizens. There are zero civil investigators, who find out who is responsible for these billion-dollar messes that we have to clean up, and requires them to fund the cleanup,” Kaptur said. At the committee hearing former EPA Administrator Scott Pruitt told Kaptur that the Office of Management and Budget lifted an agencywide hiring freeze specifically for Region 5 employees. Since then, the region has made several new hires. In a June memo obtained by Federal News Radio, Region 5 EPA Administrator Cathy Stepp announced she had hired more than 20 new employees. “I appreciated this will not backfill every vacancy that has occurred, however, as I shared previously, based on the agency’s budget and taking into account the uncertainty of FY 2019, we have to be strategic as we prioritize our hires,” Stepp said. However, Mikulka expressed doubt as to whether the 20 new hires would do anything but keep up with the current rate of attrition. “I think we’re going to be back to a zero-sum game, even if we hire 20 people,” he said.